Not, by any means, a bad week. Just strange. Still behind on work, and shuttling between Boston and New York. I went to New York on Friday, got there in time to catch Michael Chabon and Zadie Smith reading at the New Yorker Festival, which had brought me in. I nearly disgraced myself by fainting during Michael's reading but managed not to (it was a close thing, and a long story). Here's a too-dark photo of Michael and Zadie afterwards. 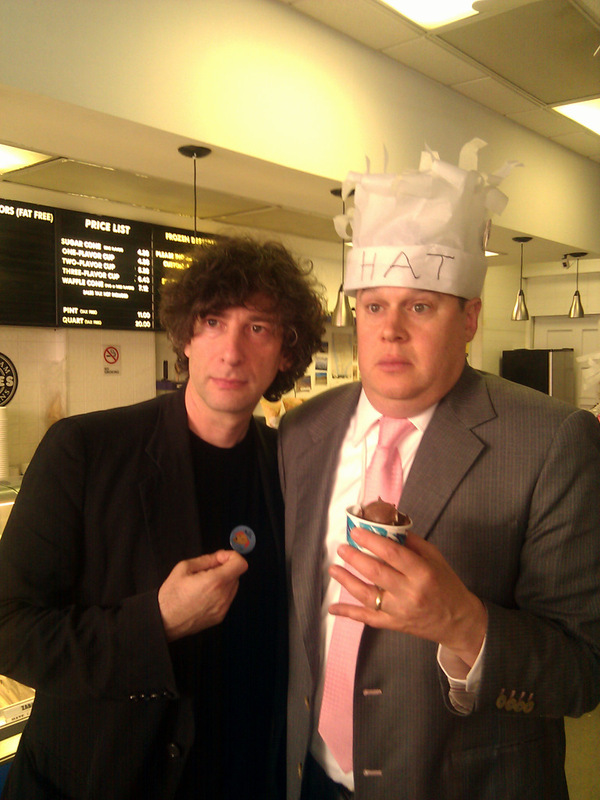 On Saturday, I went and had free ice cream with Daniel Handler (as announced on this blog). I would have liked to meet author Lemony Snicket, but unfortunately he was mysteriously detained and Mr Handler showed up as his representative. 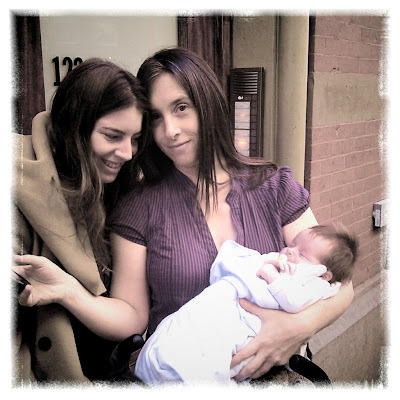 This photograph commemorates the event. I am on the left. Mr Handler is holding the ice cream. Since this photograph was taken I have had a haircut. Then Holly and I went off with the lovely Claudia Gonson and her beautiful new baby Eve. We had sushi, except for Eve, and then went to the Evolution shop where I bought a replica Dodo Skull. The dodo skull was a present for Countess Cynthia Von Buhler, whose birthday it was. She's an illustrator and artist who also throws parties, and that night was her birthday party, and she had also decided to celebrate Amanda's and my engagement. There were dead mermaids, and there was a carousel on the roof. I have never been to a party like it, nor do I ever expect to go to such a party again. If you can win at parties, Cynthia (who was a mermaid, first in a bathtub, and later carried around on a bed) won. 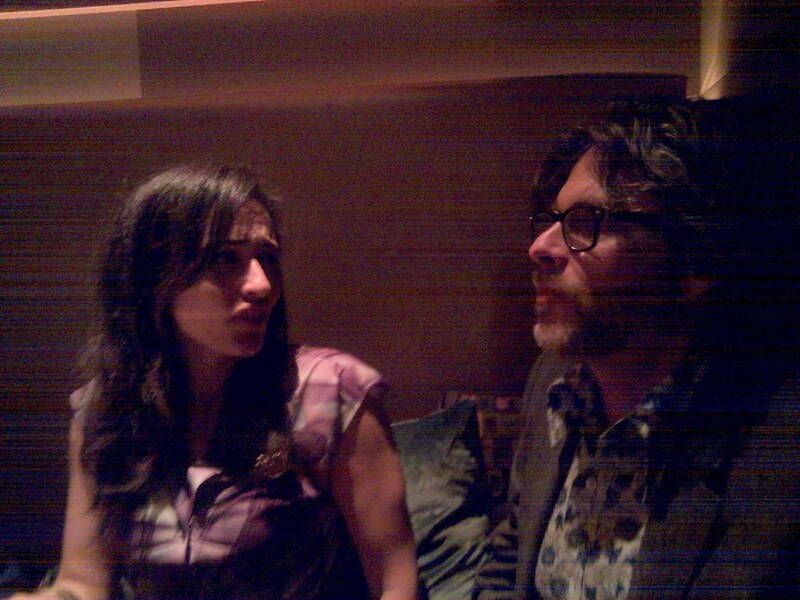 The next morning Dana Goodyear interviewed me for the New Yorker Festival, which was hugely enjoyable. (You can read an Entertainment Weekly summary at http://shelf-life.ew.com/2010/10/06/5584/). And then back up to Boston. 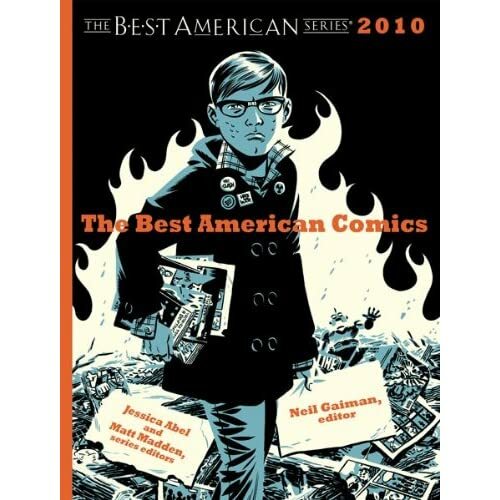 And now on the train back to New York again for an event to celebrate the Best American Comics 2010, which I've guest-edited. The Graveyard Book is now out in the US in Paperback. I keep forgetting to mention that. Here's an AMAZON Link to prove it. And here's the Indiebound link, to help you buy it from an Indie Bookseller. And here's the list of US public libraries, in case you just want to borrow it from your library and read it. This came in this morning from the Hurricane Intermediate School. WE are a 6th and 7th grade public school library. A student came to us with the book Stardust and showed to us on pg. 69 that the word F**K is in the story. If this is not what you want your students to read please do not purchase this book for your library or home. Very wise advice. Although I am not sure why if you do not want your students to read it you should not buy a copy for your home. Also I have no idea why you sent that to me. But that's certainly one reason why Stardust isn't marketed for the 6th grade. It's an adult novel that was given the YALSA award for being an Adult book that teens like, and was republished as a Young Adult title in the US, but not as a children's book. I know you are just for fun, but I cannot bear it! in English it says "Plague pits is good eating". Were there Chinese plague pits? And can you explain to me why it is insulting to Chinese people? I would hate unwittingly to insult the Chinese, and want to know why it is insulting. I am sorry, for what book I have read was translated into Chinese, for the sentence that you wrote as "Plague pits is good eating" translated in Chinese means that "ten thousands of men were torture to dead and buried in pits" and it happened in 1910s to 1930s when Chinese Government at that time was very weak, and the country was colonized by some westen countries and Japan, our government could not protect his people, so the workers in factories that invested by foreign countries such as coal miners died many during that time! By now I know it is translator's fault, not of yours. "Plague pits is good eating" in Chinese that I translate means “鼠疫坑很好吃”is not insulting. Over at http://americanindiansinchildrensliterature.blogspot.com/2010/04/what-neil-gaiman-said.html Debbie Reese correctly called me out earlier this year on something particularly stupid and offensive I said last year when I was asked at ABA about why I hadn't set The Graveyard Book in the US. I think I mostly was trying to answer with my Author Head rather than my Being Interviewed Head -- trying to describe how I perceived my potential cast of characters in a European Style graveyard in a small US city (like the UK one in The Graveyard Book). I remember thinking at the time that it was a remarkably stupid thing to have said, but stupid things come out of your mouth when you're being interviewed, and you press on. I was put out of sorts by Deb's initial post (mostly because I was reading it going "but that OBVIOUSLY wasn't what I meant"), and was idiotically grumpy on Twitter, but when I was called on it (by Pam Noles), and finally looked at the actual words recorded, I realised that people were perfectly sensibly taking what I said to indicate that I thought that a) the US was pretty much unpopulated before the arrival of the white colonists in the 17th century, and/or that b) I was being dismissive of the slaughter of Native Americans, or simply that c) Native Americans were somehow inconsequential in the history of the Americas. (None of which was my intention. But intentions only take you so far.) And you don't use a phrase like "dead Indians" without summoning, wittingly or unwittingly, the shadow of the phrase "the only good Indian is a dead Indian". People have asked how I would have felt about the phrase "a few dead Jews" in the same place in the interview, which made me feel additionally guilty, as one of the things I missed about The Graveyard Book was that I didn't actually put any Jews in my graveyard. I wanted to, but couldn't make the history and the burial customs work. Probably I should write a Graveyard Book story with some secretly buried Jews in it, and some dead Native Americans a very long way from home. Anyway, apologies to all concerned, particularly to Debbie Reese. My sister sent me The Graveyard Book to read for Halloween. I just finished it. I enjoyed it until I got to the "extras" at the back of the book. Why did you feel the need to mention Stephen Colbert in your Newberry Medal Acceptance Speech? Now it is forever in print at the back of the book. What a shame. Your stories will live on long after nobody knows or cares who he ever was. I think you should be much more far-thinking before you clog your speeches and especially your books with flash-in-the-pans. Why. Er. Because I wanted to? Because it made my son happy that I was on his show, and there is nothing flash-in-the-pan about your children's happiness? Because it's a Newbery Acceptance Speech given in 2009, and it talks about 2009 things? Because Mr Colbert quotes J.R.R. Tolkien's description of Tom Bombadil? Here's the link to the Colbert Report episode in question. See if it changes your mind, miffed correspondent. I'm in a slightly fragile state (wearing the suit I just wore through my Dad's funeral) and he is very kind. One of the things I particularly enjoy about your work is that it usually feels like you have a consistent and relatively complete world worked out around the story you're telling. I've been working on such a world in my head for months, and it's at the point where said head will explode if I don't write it down soon, but my problem is I don't know where to start. When you start working on a story set in a new universe, where do you find it easiest to begin? Begin with the story. Always begin with the story. (Unless you're Lud in the Mist.) The world is there for the story to happen in. Here and now, you don't need to tell the history of the world before you start telling a story that happened on the Isle of Man. You tell the story and let the background and the history creep in where it's needed. The same goes for worlds you've built yourself. Train is pulling in to Penn Station.